Jaume Plensa, House of Knowledge, painted stainless steel. Photo: Sotheby's. LONDON.- THIS YEAR, between Tuesday, 9 September and Sunday, 2 November 2008, Sotheby's will return to Chatsworth to stage Beyond Limits  a landmark selling exhibition of monumental modern and contemporary sculpture, now in its third year. Following the extraordinary success of last years exhibition - at which almost all of the 22 pieces found a buyer, and which attracted more than 30,000 extra visitors to the garden at Chatsworth - Beyond Limits will once again showcase a broad range of work by many of todays leading international sculptors, as well as major pieces by homegrown UK talents. Now firmly established as one of the leading events in the UKs outdoor and artistic calendar, Beyond Limits has evolved over the last three years to incorporate ever more pieces inspired by, and created especially for, the magnificent setting at Chatsworth. Last year, the exhibition included new, site-specific  and often challenging - works by a gamut of leading names such as Marc Quinn, Damien Hirst, Zaha Hadid, Michal Rovner and Zadok Ben David - all of which were extremely well received. 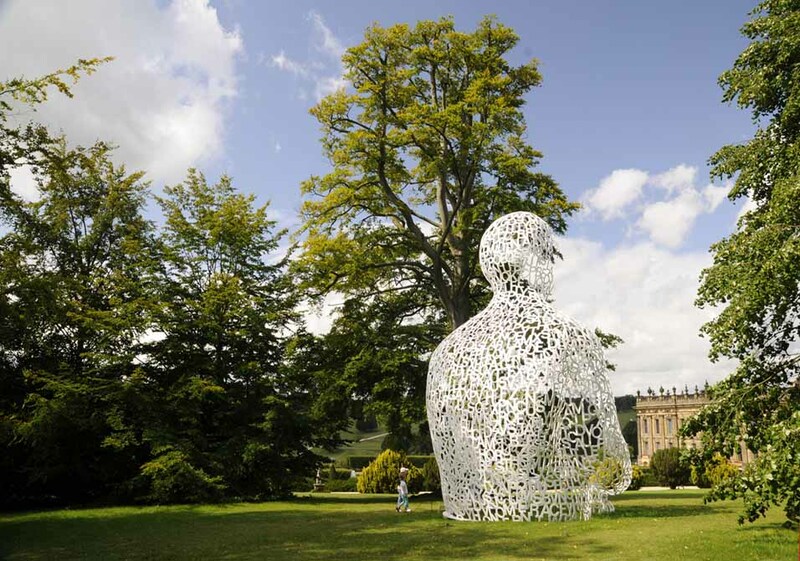 This year, in similar vein, Chilean artist Fernando Casasempere has created a work (Fusion) directly inspired by a visit to Chatsworth, while Yorkshire-born Richard Hudson has created a bronze (Love Me) especially for the occasion. Their work will be shown alongside that of other leading contemporary sculptors, such as Fernando Botero, Kiki Smith, Bernar Venet, Marc Quinn, Jedd Novatt, Arnaldo Pomodoro, Ron Arad, Beverly Pepper, François Xavier Lalanne, Robert Indiana, Manolo Valdes, Kan Yasuda and Eric Goulder. While contemporary sculptors dominate, their work will be complemented by that of artists whose work defines the modern era of the early 20th-century  artists like Salvador Dalí, Aristide Maillol and Lynn Chadwick. Aside from the sheer magnitude and arresting nature of the works to be exhibited this year, what is also striking is the international range of participating artists, with Columbia, Israel, Chile, Japan, France, Italy, England and the USA all represented. Working in a variety of media  everything from bronze to ceramic, steel and stone - this eclectic mix of talents brings a feel of modernity and exoticism to the lush green tranquility of one Britains most splendid stately gardens. Carefully  often playfully and surprisingly  positioned around Chatsworths 105-acres of gardens under the unerring eye of guest-curator Janice Blackburn, the 25-odd sculptures in this years Beyond Limits show are sure to provide plenty to feed the eyes and the imagination of visitors and prospective purchasers alike.